It has TCG (Time Controlled Gain) which compensates for amplitude decay with distance. A very useful feature. Test Range 2.5mm to 10 meter (0.100 in to 400 in) (longitudinal waves in steel). Fine mode is adjustable in minimum step of 0.01mm (0.001in). Velocity 1000 met. /sec to 15000 met. /sec (40 in/millisecond to 600 in/millisecond). In Hot key mode it has pre-set values. Fine mode it is adjustable in step of 1met/sec.(1in/millisecond). Delay Variable from -10 to 2000mm (-0.3 to 30 inches). Gain 100 dB calibrated gain adjustable in 0.1, 0.5, 1, 2, 6 or 12 dB step. Rectification Full-wave rectified, Half wave – ve, Half wave + ve, and RF mode. Linearity Deviation Vertical ±3% Horizontal: ±0.5%. Transmitter Transmission pulse negative spikes. (Pulse rise time<10ns) and with Selectable high (300 Vp) or low (250 Vp) power. Damping Damping high/low is selectable. (High= 45Ώ, Low=345Ώ). Freeze/ Peak Freeze A-scan Freeze, Peak freeze, echo dynamic available. In peak freeze it holds peak amplitude pattern which is useful for angle beam probing to to locate peak signal. Monitor Dual gate with threshold adjustable in 1% of the screen height with +ve/-ve, Gate expand Interface trigger modes. A-scan Memory 500 trace patterns can be stored which can be recalled, printed, or transferred to PC via USB (with NOTE/DETAIL). Unlimited No of A-scan can be directly stored in USB disk with auto file naming. B-scan Memory 50 B-scan can be stored (with NOTE/DETAIL) which can be recalled, or transferred to PC via USB. Unlimited no of B-scan can be directly stored in USB disk with auto file naming. T-LOG 20000 readings can be stored in 20 different files. Five different types of file templates for file creation. Stored readings can be transferred to PC via USB. DAC Dynamic DAC curve can be digitally plotted (smooth parabolic curve) on screen with selectable additional offset curves from 0 to 14 dB in 0.1dB selectable steps. DAC curve can be set as a flow monitor gate. DAC can be plotted using minimum 2 to maximum 10 points. TCG After plotting DAC , TCG( Time corrected Gain) can be activated. This brings All echo signals to equal height irrespective of depth. AWS Built-in Software for evaluation of defect in accordance with AWS standard. DGS Defect size evaluation based on 18 predefined probe data and one custom Probe set-up per memory location. Defect size is directly displayed in ERS Value(Equivalent Reflector Size). 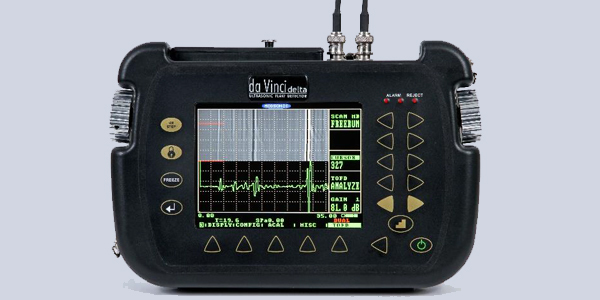 Digital Readout Thickness/Depth can be displayed in digital readout when using a normal probe and sound path, Surface Distance and depth of echo signals of GATEa /GATEb are directly displayed when angle probe is in use. Measurement point can be selected to be peak or flank. Echo height, ERS value, dB diff of DAC/DGS curve to signal height, Echo height respect to DAC in terms of percentage or in dB can be measured, T-minimum, Travel-distance can be measured when encoder is connected and time of travel during Freerun B-scan . Measurement Unit Metric or British unit of measurement is selectable. Software dVaSoft Interface software for transferring A-scan / B-scan/ T-LOG from da Vinci to PC is supplied with da Vinci delta. Printer USB printer (PCL3 compatible) can be directly attached to da Vinci delta for Attachment printing of stored A-scan waveform with calibration data and note detail. Display High brightness active matrix colour TFT LCD display. Display area 320×240 Pixel (117×88mm). Five different colours and Grid scheme options. colour leg facility for angle probe for easy interpretation of skip distance. Full Screen By pressing enter key for a few seconds A-scan will be displayed in Full screen area. Reference A-Scan Reference A-Scan pattern of standard test object can be saved and recalled in background for easy comparison during testing. Video Output VGA video signal output for monitor/projector connection. PRF 4Hz TO 500Hz. Selection in 10 scalable steps. PRF can go down up to 4Hz When PRF is selected to 1 and maximum achievable coupled to range when PRF is selected to 10. Color coded B-scan In real time display color coded B-scan as well as live display A-scan. captured B-scan gets stored in external USB pen drive. TOFD Display In real-time RF A-scan and TOFD D-scan. After collecting data, stored data or A-scan pattern can be reviewed using cursor. Recording Free run or with positional encoder for actual location. Record Length 1000mm test length with collection step of 1mm. Each A-scan with 500 point depth. I/O port Optical encoder can be connected to ‘da Vinci ‘delta for positional detail. It can be used for Encoded B-scan. Data Storage Each Scan file is stored in external USB storage device with auto file naming. Power Lithium-Ion battery pack 10.8 VDC, 7.8 AH, gives 8 hours continuous Operation from fully charged battery. Battery with the charge indicator/fuel gauge indicator. da Vinci delta can also operate on 6 nos of C type dry cells. Battery Charger Input volt 100 to 240VAC / 50 Hz. Temperature 0 to 55° C.